Well trained and well disciplined, Byzantine Lancers are well armoured and equipped with a lance and a sword. 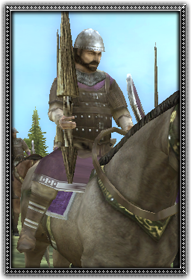 Common throughout the Byzantine Empire, their training and discipline makes them very useful on the battlefield. Originally armoured with the padded kabadion (gambison) and either klibanion (lamellar) or lorikion (hauberjon - mail or scale) and armed with lance, sword and mace, they formed around 60% of the line cavalry.